A dear friend of mine has been on a long and winding journey to parenthood. Recently, she reached an important milestone. She has now been officially approved by the powers that be to adopt a child. Woo hooo! It's still a waiting game. But it is going to happen! In celebration, I decided it was the right time to make a gift for the momma-to-be. The baby's room is done in soft, neutral greys and white. And there is a funky faux white moosehead on the wall. A cuddle-moose, I decided -- that's what every Canadian baby needs! Turns out, patterns for moose cuddlies are surprisingly hard to come by. 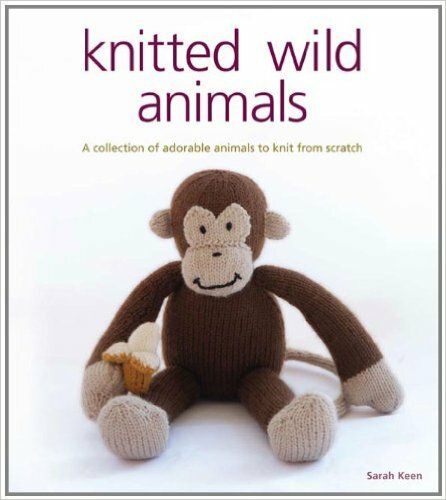 Happily, I found a sweet one in Knitted Wild Animals: A Collection of Adorable Animals to Create from Scratch by Sarah Keen. The photographs and layout are absolutely charming, and the instructions were clear and easy to follow. The book seems to be out of print, but I was able to get a very gently used copy through amazon.ca. For the body and hooves, I used Patons North America Classic Wool DK Superwash (2 50g skeins for the body and a small amount of the lighter skein for the hooves). The antlers were made from Bernat Cotton-ish to get the desired colour and a white pipe cleaner to keep them perky. Momma may wish to remove the pipe cleaner before letting the little person loose with the moose, depending on how wee said person is. It's not a choking hazard, but pipe cleaner ends can be scratchy and could poke through the fabric of the antlers. In the meantime, he patiently waits, antlers aloft with anticipation.